Welcome back to Todd and Penguin! Please accept my apologies for the lack of updates recently. As some of you know, I lost my job this summer and I've been pretty busy searching for new opportunities. Time I usually spent on comics was spent learning new skills in attempt to start down a different career path. Nothing has happened yet, but I hope to remedy the situation soon. In the meantime, I'm going to devote my weekends to comics again, meaning regular updates for Todd and Penguin starting Monday Feb. 16. I'm also bringing back a re-launch of Taking Up Space, which can be found at my new blog, IDrawComics.com. As a special treat, a special mystery artist is lending their talents to the cause by providing guest comics for the next several weeks. 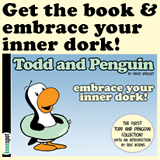 The comics are old school Todd and Penguin style, back when the comic was just Todd, Penguin and Mr. Bear. If you have any guesses who the artist is, email me. The first person to guess correctly will get a signed copy of one of the guest comics from the mystery artist. One of the most frequent questions I get is how to subscribe to Todd and Penguin's RSS feed. Just click on the orange button in the navigation menu and you can subscribe with your favorite RSS reader and get updates whenever a fresh Todd and Penguin hits the server!